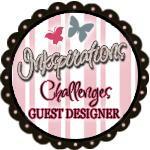 inkyloulou Designs: Inkspirations Guest Designer- That's Me!!! What a wonderful surprise it was last Friday when my card was announced the winner of the Inkspirations challenge.........very exciting!!! And what made it more exciting was the opportunity to be the Guest Designer for this week's challenge. I'm actually really, really happy with how it has turned out. To get the muted effect of the Not Quite Navy flourishes on the circle I firstly slightly dampened some watercolour paper and then stamped off the image twice before stamping on the circle. The scallop around the edge of the circle is created using the scallop oval punch. The little tab for the sentiment is made using the scallop oval punch and cutting off the top and bottom, an idea I got from Lisa Jansen. I was so excited to get the chance to use the truly gorgeous (and now retired) Kiwi Kiss and Very Vanilla satin ribbon again. Will be back later to show you Elliot's super cute 2nd birthday party invites that I have been working on this week. Louise!!! Congratulations.. truly deserved, your cards are ALWAYS gorgeous and this one.. well.. no exception.. STUNNING. Louise this is BEAUTIFUL!!! Love it to bits! This is such a gorgeous card, love how you've used the colours & the layout is fab.